Few things have been around as long as the Stanley Classic Stainless Steel Vacuum Bottle , in fact a variation of this bottle has been around for over 90 years. That right there should tell you something about this product, it is extremely popular and it works. Several companies have had the right to manufacture this particular design of vacuum bottle, the latest being PMI. The design is strange as it is an inner and out bottle separated by a vacuum and the bottle is insulated with ground charcoal dust. It is basically the same design from 90 years ago because it works. Anyone who has any issues with this not keeping beverages hot or cold is either not following the instructions or has a defective bottle (which could happen if the vacuum were somehow compromised). The directions are simple: before filling the bottle with a HOT beverage fill it with boiling water and let it sit for 30 minutes or so, this will prevent the bottle from becoming a heat sink when you pour in your HOT beverage (which would make it get cold very quickly). If you want to place a cold beverage in it I would stick in in the freezer till it is completely cold before filling. When the directions are followed I have easily had this keep a beverage HOT for 8-12 hours and still be WARM as long as 16 hours later. Follow the directions and you will be able to duplicate my experience with the product. I have 2 of these and have had my oldest one for about 5 years or so, I just recently picked up the second one because the wife and I do long cars trips and coffee is not an option for us to go without. I can recommend anyone who needs a beverage container to pick up one of these timeless classics, you can even get some vintage ones on eBay for a reasonable price if you spend some time doing some research. 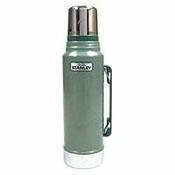 Go out an get your Stanley Classic Stainless Steel Vacuum Bottle today!